2760 West Seven Mile Road. Frank Lloyd Wright, his supporters would aver, was the most accomplished and innovative US architect of the 20th century. He was born in 1869, learned from Joseph Lyman Silsbee who wrote about Queen Anne revival architecture, and then worked for the famous Chicago architect, Louis Sullivan, from 1888 to 1893. In 1889 he designed his first buildinghis studio and home in Oak Park, just to the west of Chicago. He was much impressed by the developing Arts and Crafts movement, and was a founding member of that society in Chicago. He was influenced by the ideas of William Morris, founder of the Arts and Crafts movement, and by John Ruskin's ideas about the importance of nature itself and personally developed crafts in architecture. Late in the 19th century, Wright began to develop his distinctive Prairie style of home design. These homes features a central core with a large and dominating, usually flat, roof that was intended to float over the structure. 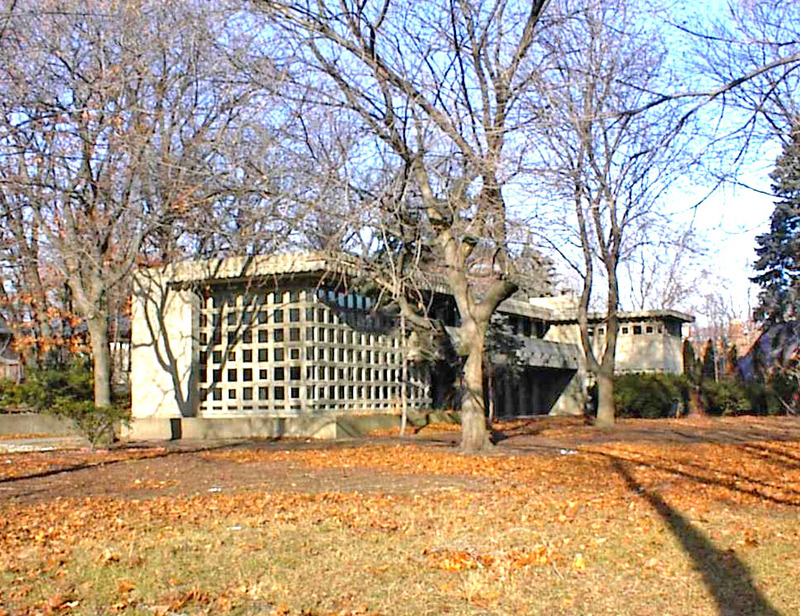 In 1908, he designed the Robie House near the campus of the University of Chicago, an example of his distinctive design. By about 1910, Wright's creativity was widely recognized in the United States and Germany. Despite a troubled personal life, he designed a variety of interesting homes and building, especially in the Midwest. By the 1930s, he developed what he called the Usonian style of construction, a manner of rapid construction that bordered on prefabrication. Throughout the United States, you will find examples of Wright's architecture. Most of his homes may be identified by their flat roofs, by their allowing extensive light to enter, and by the placing of walls is other than expected places. There is a great deal that is extremely creative about the Wright buildings when compared to those in the Queen Anne revival style or in the Second Empire style. Frank Lloyd Wright designed 70 structures to be located in Michigan and at least 30 of them were built. Dorothy S. Turkel read Frank Lloyd Wright's The Natural House and then commissioned Wright, in 1955 to express his creativity in a home for her property on West Seven Mile. He designed a two story, long, narrow concrete block residence using what he called the Usonian Automatic approach. This involved building a home with precast concrete blocks joined with steel reinforcing rods and concrete. This home is entirely built with concrete blocks. Wright had been working with concrete blocks for homes since the early 1920s. In the post-World War II era, he had hopes of designing a construction strategy that could be used by the returning soldiers to build their own homes. The Turkels paid more than $65,000 for this home, which was a very large amount in the late 1950s. One reason was that Wright called for more than three dozen different types of custom designed concrete blocks. You will observe that there are no regular windows in this L-shaped 4,000-square foot home, but an immense amount of Michigan sunlight is admitted to the living areas by the spaces between the concrete blocks that make up what many would call the wall. To reduce construction costs, there is no basement. You will notice the emphasis on the rectangular and the flat rooftypical attributes of the homes Wright designed. The origin of the word Usonian is unclear. Many think that Wright developed it from the initials of the United States of North America. While the Wright homes have great historical value, the Usonian style of building did not become popular. Thomas Monaghan, the extremely prosperous founder of Domino's Pizza and the owner of the Detroit Tigers when they last won a world's championship in 1984, owned this home when he was collecting objects and buildings designed by Frank Lloyd Wright. At one point, he apparently intended to donate the home to the University of Detroit but that contribution was not completed and Monaghan subsequently sold the home. He never lived in this attractive and typically Frank Lloyd Wright home. This is the only structure in the city of Detroit designed by Frank Lloyd Wright. Architectural Style: Wright used the term Usonian Automatic to describe the style of this home.